For my card, I colored up the pretty little Lotus Blossom flower and used the matching die to cut it. The sweet 2x2 stamp is just SO cute! I colored it with copics. I stamped part of the sentiment from the Smile stamp set onto smooth white card stock that I cut out with one of the A2 Double Stitched Frame dies. 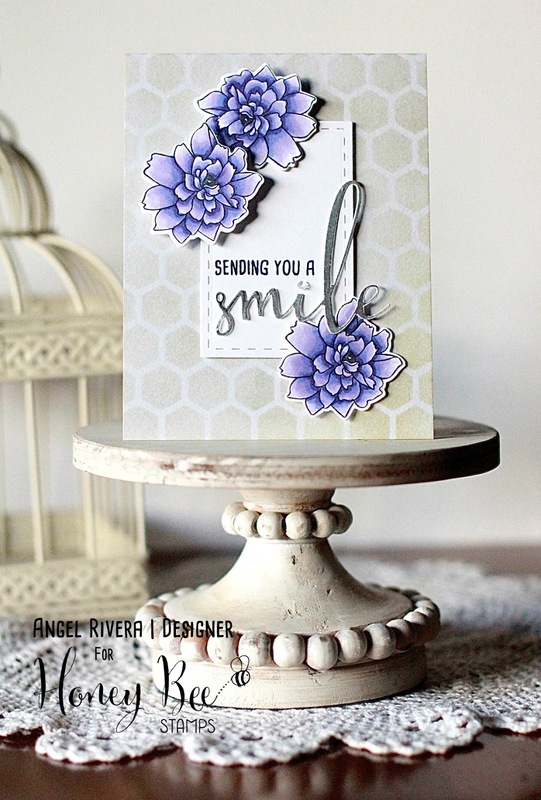 I stamped 'Smile' with Versamark then embossed with silver embossing powder, then die cut it with the matching die. A clear mini sequin dots the 'i'. Everything is layered over my grout gray card base that was sponged with one of the Hexagon Layering Background Stencils.